சீனாவில் நடைபெறும் உலக டூர் ஃபைனல்ஸ் பாட்மிண்டன் போட்டியின் மகளிர் ஒற்றையர் பிரிவு இறுதிச்சுற்று ஆட்டம் ஞாயிற்றுக்கிழமை நடைபெற்றது. இதில் இந்தியாவின் நட்சத்திர வீராங்கனை பி.வி.சிந்து, ஜப்பானின் நஜோமி ஒகுஹராவை எதிர்கொண்டார். Pusarla Venkata Sindhu (born 5 July 1995) is an Indian professional badminton player. She became the first Indian woman to win an Olympic silver medal, and one of the two Indian badminton players to ever win an Olympic medal – other being Saina Nehwal. Sindhu won silver in Women's singles at Commonwealth Games 2018 . She was also a silver medalist at the 2017 BWF World Championships and 2018 BWF World Championships consecutively. She was also a silver medalist in Asian Games 2018 which were held in Indonesia. 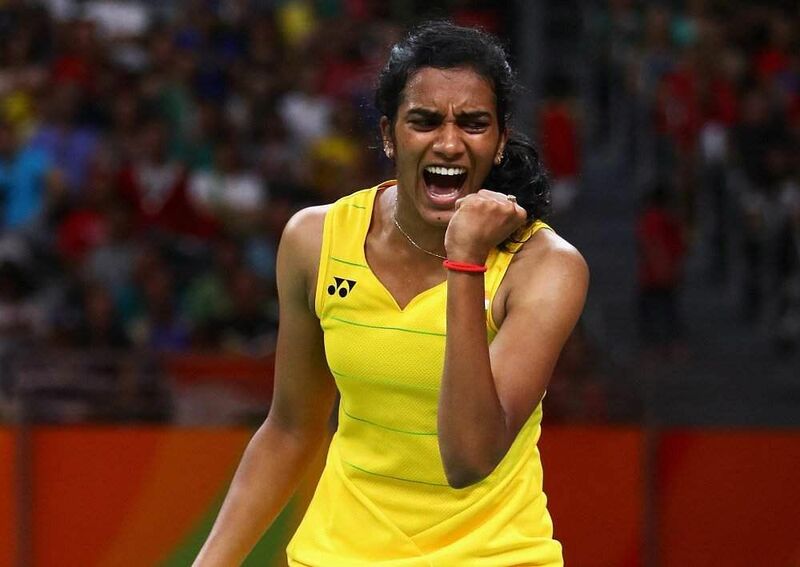 It is indeed a great victory for PV Sindhu after all the silvers in the recent past. Jinx has finally been broken after being the second best in Olympics, World Championships, CWG and Asian Games. 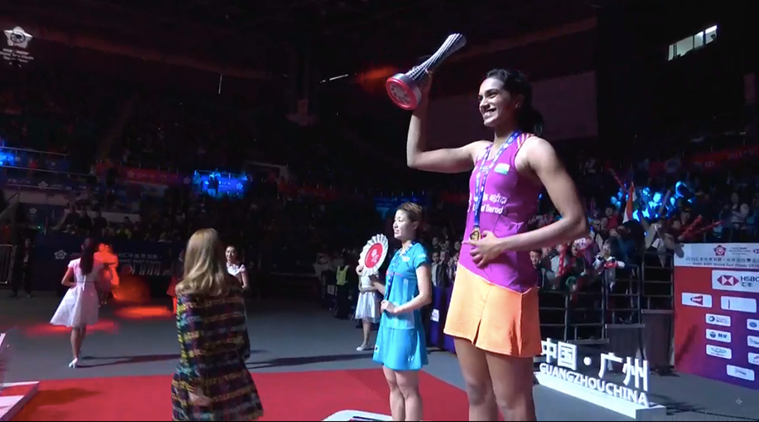 PV Sindhu ends the year on a high as she beat Nozomi Okuhara 21-19, 21-17 to become the first Indian to win the title of women's singles BWF World Tour Finals on Sunday. After losing five finals this year, PV Sindhu ends the year on a high as she beat Nozomi Okuhara 21-19, 21-17 in the final to become the first Indian to win the title of women’s singles BWF World Tour Finals on Sunday. The Indian shuttler beat World No. five Okuhara from Japan to record her 300th career match victory across categories. Olympic silver medallist PV Sindhu made history by becoming the first Indian to win the season-ending BWF World Tour Finals. The Indian superstar beat a familiar foe in Nozomi Okuhara of Japan 21-19, 21-17 in the final to claim her first title of the year. Sindhu had a tough time this year, unable to win even a single tournament this year but the Indian shuttler was in top form and ended the tournament unbeaten. In both games, Sindhu made a fast start but Okuhara managed to stay within touching distance. Sindhu, though, had just too much in her locker and won points at crucial junctures to maintain her dominance in the match. The 23-year-old had beaten Ratchanok 21-16, 25-23in a captivating semi-final on Saturday. 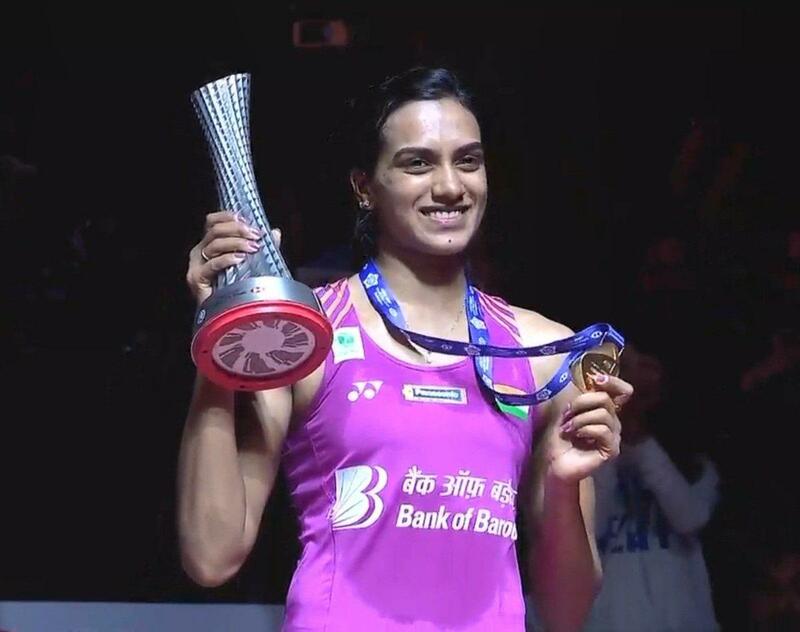 PV Sindhu made history on Sunday, becoming the first Indian to win the season-ending BWF World Tour Finals tournament. Sindhu came up against a familiar foe in Nozomi Okuhara in the title clash but unlike her previous meetings, the Indian superstar showed much more patience in her gameplay against the Japanese. This was critical to the Indian shuttler's cause as Okuhara was made to toil and given no breathing space as PV Sindhu claimed a 21-19, 21-17 win in the final for her first title of the year. Sindhu, who had lost in the summit clash to another Japanese, Akane Yamaguchi in the last edition, put in a brilliant all-round display to give no chance to Okuhara in the final. Sindhu had a tough time this year, unable to win even a single tournament but the Indian shuttler was in top form and ended the season-finale unbeaten. In both games, Sindhu made a fast start but Okuhara managed to stay within touching distance. Sindhu, though, had just too much in her locker and won points at crucial junctures to maintain her dominance in the match. After leading the second game from start to finish, the Indian star grabbed three match points and converted them immediately to seal the issue in her favour. The 28-year-old Indian has suffered numerous heartbreaks in finals of tournaments in recent years. She took home the silver after losing to Spain's Carolina Marin at the 2016 Rio Olympics. She suffered more heartbreaks at the Asian Games and Commonwealth Games this year, and has also twice lost in the final of the World Championships and was runner-up in last year's season finale. The world number six, renowned for her never-say-die attitude, put all her past disappointments behind her in the Chinese city of Guangzhou, beating the fifth-ranked Okuhara in straight games in the women's final that lasted just over an hour. Sindhu, who was always in control of the match, sealed the championship with a forehand smash, before collapsing to the court floor on her hands and knees. The men's final later Sunday tees up the two top players in the world, top-ranked Kento Momota of Japan against number two and home star Shi Yuqi. PV Sindhu maintained her unbeaten record at the 2018 BWF World Tour Finals as she defeated the 2013 world champion Ratchanok Intanon in an intense semifinal in Guangzhou, China on Saturday. With the thrilling win against Intanon, PV Sindhu reached the final of the competition for the second successive time. In the men's singles event, Sameer Verma suffered a heartbreak as he lost 21-12, 20-22, 17-21 to World No. 2 Shi Yuqi of China in an epic battle that lasted an hour and eight minutes. Sindhu, who finished runner-up in the last edition, registered a 21-16, 25-23 win against Intanon in 54 minutes. 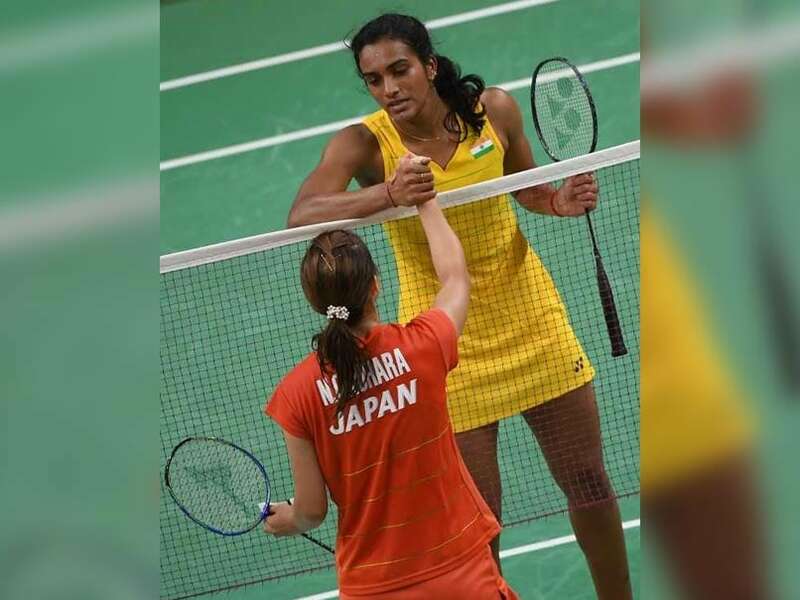 Olympic silver medallist Sindhu, will be up against Japan's Nozomi Okuhara in the final of the tournament on Sunday. When is the PV Sindhu vs Nozomi Okuhara, BWF World Tour Finals match? The PV Sindhu vs Nozomi Okuhara, BWF World Tour Finals match will be played on December 16, 2018. Where will the PV Sindhu vs Nozomi Okuhara, BWF World Tour Finals match be played? The PV Sindhu vs Nozomi Okuhara, BWF World Tour Finals match will be played at the Tianhe Gymnasium in Guangzhou, China. What time does the PV Sindhu vs Nozomi Okuhara, BWF World Tour Finals match begin? The PV Sindhu vs Nozomi Okuhara, BWF World Tour Finals match will begin at 10:30am IST. Which TV channels will broadcast the PV Sindhu vs Nozomi Okuhara, BWF World Tour Finals match? The PV Sindhu vs Nozomi Okuhara, BWF World Tour Finals match will be telecast on Star Sports 1, Star Sports 1 HD. How do I watch the live streaming of the PV Sindhu vs Nozomi Okuhara, BWF World Tour Finals match? The live streaming of the PV Sindhu vs Nozomi Okuhara, BWF World Tour Finals will be available on Hotstar. For live updates, you can follow sports.ndtv.com.